Iterated function system 3 afine maps. Iterated function system 4 afine maps. The Sierpinski triangle from a slide in GeoGebra. Another example with a different array. In this book I will put some fractals that I created with GeoGebra. I will also compare the constructions I made a few decades ago with JavaSketchPad. I hope it can be useful to someone. References: Peitgen, H., Hartmut Jürgens, and Dietmar Saupe. 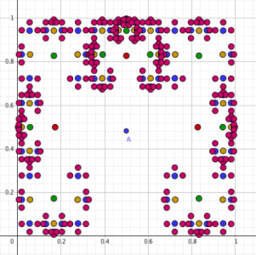 "Fractals for the classroom: part one. Introduction to fractals and chaos. With a foreword by Benoit B. Mandelbrot." Springer Science & Business Media, 1992. Peitgen, Heinz-Otto, Hartmut Jürgens, and Dietmar Saupe. Fractals for the classroom: part two: complex systems and mandelbrot set. Springer Science & Business Media, 2012.